The Benghazi-based rebel Transitional National Council said Col Gaddafi's offer was not credible and that the time for compromise had passed. At least two loud explosions were heard in the capital, Tripoli, on Saturday evening. One shook the hotel where foreign journalists are staying, not far from Col Gaddafi's sprawling Bab al-Aziziya compound. "We were the first to welcome a ceasefire and we were the first to accept a ceasefire... but the Crusader Nato attack has not stopped," he said. "The door to peace is open." "I have no official functions to give up - I will not leave my country and will fight to the death," he vowed. But the vice-chairman of the Transitional National Council rejected the offer of negotiations, saying the Libyan leader had "offered ceasefires only to continue violating basic human rights, international humanitarian law, and the safety and security of Libya and the entire region". "Gaddafi's regime has lost all credibility," Abdul Hafiz Ghoga said in a statement. "Thousands of innocent civilians have been killed or injured. Countless others have been detained, tortured and are still missing." "The time for compromise has passed. The people of Libya cannot possibly envisage or accept a future Libya in which Gaddafi's regime plays any role." 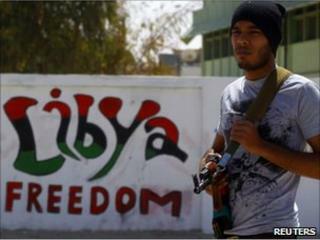 Another rebel spokesman told the BBC that only Col Gadaffi's forces could cease fire because they had all the weapons. "We need to see not words but actions," one said. "The regime has announced ceasefires several times before and continued attacking cities and civilians." During Col Gaddafi's speech Nato reportedly bombed a government complex that included the state television building in Tripoli. The Libyan government said the strike was meant to kill Col Gaddafi. Nato also said its warships had intercepted several small boats laying mines in the sea near Misrata's port to stop legitimate aid shipments. "All the humanitarian missions are stopped now because they can not get any humanitarian aid inside," said Fadl Moukadem of Mercy Corps. Government spokesman Moussa Ibrahim said he was unaware of any attempted mine-laying. However, he said Col Gaddafi's forces had been trying to prevent weapons shipments reaching the rebels in Misrata by sea. He also warned that if rebels in the Libya's third largest city did not lay down their arms in return for an amnesty, they would face "total fire". The BBC's Ian Pannell in Tripoli says that despite claims loyalist forces are in control of Misrata, it seems that the government is on the back foot, under pressure from Nato and desperate to reverse recent losses.